Recorded live at Massey Hall, Toronto, May 15th 1953. ...finally in sound quality that does justice to the playing. In assembling this release I've tried to bring together all of the available tracks of this historic concert, which has resulted, in the case of the Trio section, in some variation in sound quality. On this recording you will hear only the original recordings, with the bass part as originally played and restored to something closer to an appropriate level by the XR remastering process. One may ask as to why this concert needs another release? My answer is that, for such a historic recording, all of the previous issues have failed to convey, through their sonic flaws, the full impact of the playing and overall sound. That five men, who'd never rehearsed together or played together as a group, could arrive at a two-thirds-empty hall, missing a saxophone (so playing a plastic one bought that day), half drunk (and more drunk after the interval) with one member on release from a psychiatric hospital, with the two lead players apparently not speaking to each other and conjure up such magic, is incredible. To finally hear it in this quality of sound more than justifies the hours of painstaking work it's taken me to bring this project to fruition. Despite owning copies of this recording for many years, I've heard it anew over the last few weeks, and since its completion it has rarely left my CD player. I hope you'll find similar inspiration from it! The vagaries of art are exceedingly strange. By rights, this concert should have been an utter failure, not one of the most legendary in the history of jazz, because everything conspired against it. 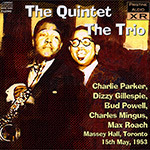 In early 1953, the New Jazz Society of Toronto decided to “reunite” early bop greats for a concert on May 15. Oddly enough, the contractor for this session was bassist Charles Mingus, who spent most of the 1940s in California and, musically speaking, was not a bopper. Mingus, however, had been in New York for a few years by this point, and knew all these musicians personally; so he contacted them and convinced them to participate. From the beginning, there were problems. Powell had to be signed out of a mental hospital where he was being treated (badly beaten on the head by white attackers around 1947, Powell had a metal plate in his head which led to years of mental illness). Parker, going through one of his recurring bouts with heroin addiction, had pawned his Selmer saxophone and couldn’t afford to get it out of hock. This led to an explosion from Gillespie, who insisted on promptness and professionalism. Needing an instrument, Parker rented a cheap plastic horn. After arriving at LaGuardia airport, the group, now consisting of seven people due to the addition of Mingus’s wife and Birdland’s Oscar Goodstein, discovered that only five had been booked on the pre-arranged flight. Two tickets had to be bought for the following flight and, for reasons unknown, the party decided to leave Parker and Gillespie behind for this second plane. The several hours’ wait between planes brought their former disagreement to a point of explosion. By the time they got to Toronto, neither was speaking to the other. Whether due to poor weather, poor promotion, or lack of interest, Massey Hall was two-thirds empty that night. The original plan was for the musicians and the New Jazz Society to split the profits, but in fact they couldn’t even afford to pay the musicians. All of them got NSF checks but, by a stroke of luck, Parker was actually able to cash his. Goodstein, however, had recorded the concert on a portable tape machine, and it was this tape that Mingus procured. Disappointed with the poor low range of the recording, he overdubbed new bass lines and issued the records independently on his Debut label as “The Quintet” and “The Trio.” From that day to this, the concert has been considered one of the high-watermarks of jazz, and issues with and without Mingus’s overdubs have been available for decades. For this new reissue, Andrew Rose wisely decided to work from the original tapes without the bass-line overdubs. Despite the circumstances working against this concert, the performances were simply brilliant, and in an era when Parker was more concerned with recording “Bird with Strings” albums, the quintet performances heard here were a welcome relief. In the opener, Juan Tizol’s Perdido, the group members are still feeling each other out. Parker and Powell are the most inventive if a bit timid. Mingus’s bass lines are crisp and clean, but not particularly inventive. Gillespie’s solos are careful, relying on remembered licks and quotes from old tunes. With Salt Peanuts, however, the group breaks loose, and from then on the concert moves from strength to strength. Comparing this issue with the version I have with bass overdubs (Debut 044, issued on CD by Prestige), there are a few moments when you miss the crisper, cleaner sound of the re-recorded bass, but in opening up the sound of this record, Andrew Rose has both revealed more hall ambience and brought the lead instruments into clearer focus. All the Things You Are begins and ends with a brief chromatic passage courtesy of Mingus, who later developed it more fully for his own concert at The Bohemia in 1955. By then he called the piece “All the Things You C-Sharp,” since the introduction was derived from Rachmaninoff’s famed Prelude in C♯ Minor. The group is really flying now; Powell and Mingus feed some bizarre extended chords in the accompaniment, and the horn-players respond with some of their most adventurous playing. Two of Parker’s little turnaround phrases, at 1: 48 and at 2:28, show how sharp his ear was and how extremely well he could think ahead of the chords. Gillespie sticks the mute in his horn for this one; this was to become more of a habit for him as the years went on, much to the dissatisfaction of his earlier fans. He is generally at the top of his game as well, despite a quote from Ferde Grofe’s “On the Trail.” When it’s his turn, Powell proves that he could improvise on any chord he fed the others. He was sometimes criticized for being primarily a right-handed pianist, but it was simply his way of feeding himself a harmonic base to improvise upon. During Mingus’s bass solo, Parker and Gillespie feed him some strange chords. After the C♯ passage, the group switches to double time for the finale. Wee, also called Allen’s Alley (and recorded under that title by a Coleman Hawkins bop group for RCA Victor), goes like a shot—perhaps a little less harmonically adventurous than Salt Peanuts or All the Things You Are, but inventive nonetheless. Dizzy is done with his mute and his pop tune quotes; Bird’s opening solo put him on the firing line, and he responds with truly vintage playing, not a fill, not a moment’s coasting. As good as Gillespie is, Powell matches him; no phrase ends where you expect it to, harmonically. Max Roach has an excellent drum solo in this one. Gillespie’s classic A Night in Tunisia provides a fitting wrap-up to the quintet session. As an interlude, the quintet set was followed by a five-minute drum solo. Drum solos don’t impress me, particularly when not tied to surrounding material, but Mingus liked it so much that when he gave his afore-mentioned Bohemia concert two years later, he invited Roach to perform it as a drum duet with Willie Jones, which he called Percussion Discussion (he even worked “Percussion Discussion” into his score for Epitaph). Whether it was prearranged for the second half of the concert to be just a piano trio or if Parker-Gillespie hostilities had simply reached a breaking point is unclear, but either way the pianist is simply fantastic here. Rose’s remastering brings out much more of his sound than previously heard on LP or CD. (There were two more selections played that night by the trio, but Goodstein ran out of tape.) Of peripheral interest is Mingus’s showpiece Bass-ically Speaking, which he recorded with pianist Billy Taylor later that same summer. It’s not really music, just a pianist feeding chords while Mingus improvises. But this is more than made up for by a scintillating version of George Shearing’s Lullaby of Birdland, in which Powell never touches the melody until the third chorus! For those who already know and love this concert, for those who have never heard it, and for those (whom I pity) who have absolutely no clue how great the music of Charlie Parker, Dizzy Gillespie, Bud Powell, or Charles Mingus was, this CD is indispensable.